Savory Pumpkin Basil Cheesecake FTW! This easy make-ahead appetizer is perfect for parties and potlucks! Not only does it look impressive, but it’s addictively delicious! This fluffy and savory spread only takes 10-15 minutes of actual prep work… now that’s how I like to bake! The majority of the time it’s in the oven or cooling in the fridge. Hellooooo easy make-ahead appetizer for parties & potlucks! Though the prep-work is super speedy, leave enough time for this beauty to bake for 50 minutes, sit for an hour, and chill for 3 hours. It's a tried and true cheesecake method that yields perfect results! 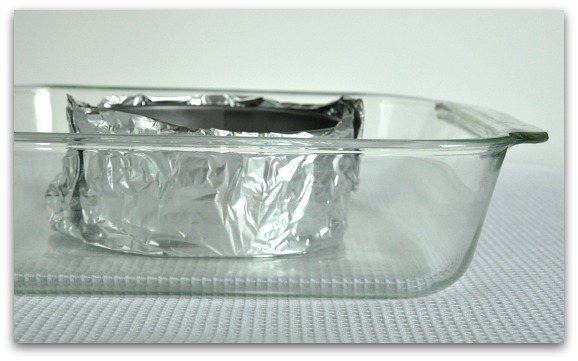 Prep your mini springform pan by lining the bottom with parchment paper and lightly greasing the sides with butter. 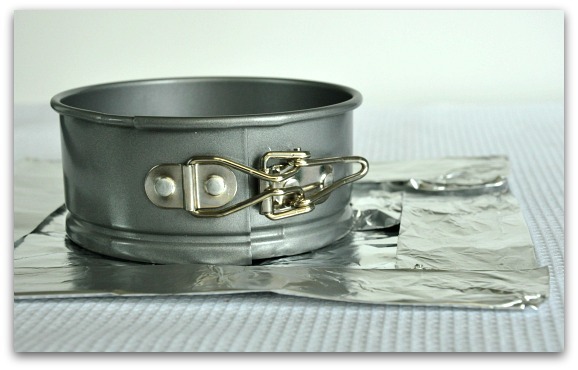 Next wrap the outside of the pan in one layer of heavy duty foil or two layers of regular foil. To do this, cut two large squares of foil, place the pan on top, centered, and fold to make a barrier along the bottom and sides, leaving the top open for your cheesecake. Place the pan in a baking dish and set aside. Combine cream cheese, ricotta, and feta in your food processor. Pulse to gently mix. Next add your egg, sugar, pumpkin and a pinch of salt and pulse again. Whatever you do, don't skip the egg, I did a few rounds of recipe testing with this and the egg-less version just didn't have the right texture/taste. Lastly, add the chopped green onion and torn/chopped basil to the mixture and pulse gently to mix. I decided to mimic a cheesecake even further and add the traditional cracker crust to the bottom, using savory Ritz crackers instead of sweet graham crackers. Crush crackers and combine with a 1/2 Tablespoon or so of melted butter. Spread evenly onto the parchment paper at the bottom of your spring-form pan and top with your cheesecake mixture. Place your spring-form pan inside your baking dish and fill with enough hot water to reach about 1/3 of the way up the cheesecake pan. Bake at 350 degrees Fahrenheit for 50 minutes. When finished, the cheesecake will be golden around the edges and wiggle a little when gently shaken. Turn off the oven but leave the cheesecake to cool down slowly in the oven for an hour to prevent cracking. After an hour has passed, cover with saran wrap and place the cheesecake in the fridge for a minimum 3 hours to set the shape. It can be chilled in the fridge up to 2 days before serving, making this a perfect make-ahead appetizer! After carefully removing from the pan, plate and serve room temperature. Leave out for 30-60 min before serving with crusty toasted bread or your favorite crackers. Drizzle with olive oil and top with basil leaves before serving for a glossy and tasty garnish! If you're new to or nervous about using a water bath for this cheesecake, an easy alternative is to place a baking dish filled halfway with water in the rack directly below the rack the cheesecake sits on. The only downside to this steaming method is that sometimes your cheesecake may crack a little. 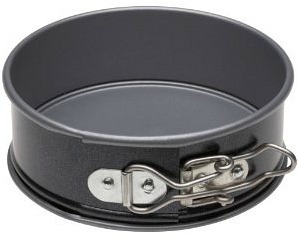 Scoop up this adorable 4 inch spring-form pan at Michael’s craft store for $3 with one of their printable coupons. You can also pick up a trio for around $8 on amazon.com. The recipe will work with both a 4-inch and a 4 + 1/2 inch pan. Between this recipe and my savory spinach and artichoke cheesecake recipe, I’ve gotten so much use out of mine over the years it’s borderline ridiculous. 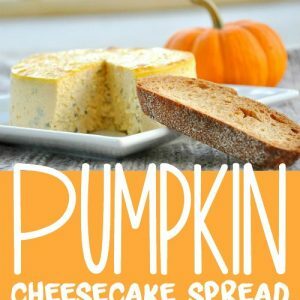 This savory pumpkin cheesecake spread is SO SO SO GOOD! I knew when I snuck a taste from the food processor that it was going to rock… but the second I could smell it in the oven, I had to refrain from popping a squat infront of it to anxiously await my snack. It smells fabulous and tastes even better! If you are one of the lucky ladies who live here and are reading this, I’m totally making you this spread. Its RIDICULOUSLY good! Though it takes some time to bake, you don’t have to babysit this at all! Just set a timer and go about your day. You’ll put in maybe 10-15 minutes of actual effort for a savory cheesecake that looks and tastes like it should be served in a fancy restaurant. In fact, one of my favorite restaurants back in Florida serves a savory artichoke cheesecake that this recipe beats the pants off of. If you’re throwing a party or attending a potluck of sorts this holiday season, totally make/bring this instead of a store bought cheese spread. It’s light and fluffy with fantastic flavor! 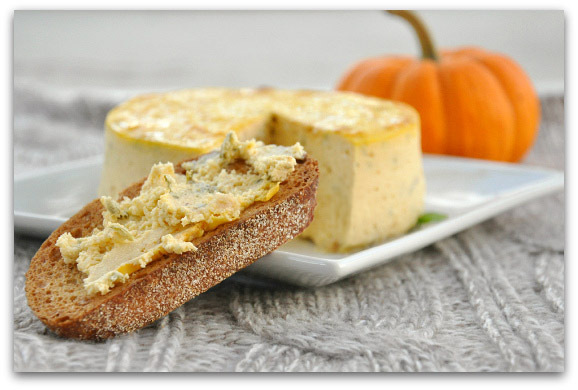 If you get a chance to try this savory Pumpkin Basil Cheesecake Spread, let me know! This was such a great appetizer for our party! I’ll be making it all fall long! So happy to hear it Julie, thank you! Hip hop, hooray for Pumpkin season! Was so tired of seeing sweet pumpkin recipes, so when I saw a savory one, I got all excited. Three cheers! Savory pumpkin is the way to my heart, always! Oh wow wow..what a amazing flavor of this cheesecake! I don’t like it, I love it! Awesome photos too! Thank you for sharing and have a lovely day! This looks insane! Who would have thought basil and pumpkin. I’m adding this to my Thanksgiving list! Hi there – I wanted to stop by and let you know that I featured this awesome recipe in my pumpkin post yesterday! 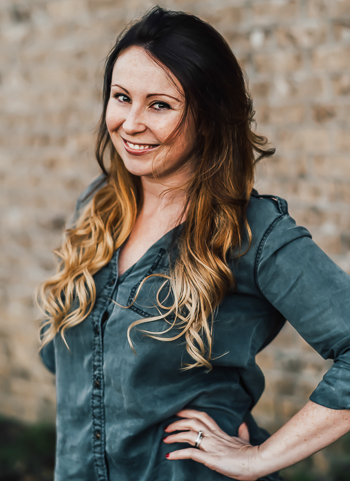 I hope you will stop by and check it out. man that looks good! Im going to try this for one of our summer wine and cheese nights! now to find a spring pan small enough! I’ve had savory cheesecake once before, but this one sounds even better. Because: pumpkin! I’m getting a grown-up camera soon so you totally need to teach me how to take pictures like yours. Your photos are so pretty! I have seen so many pumpkin recipes lately, I really want some! I so love basil and this recipe sounds awesome!! I made this last night, I’m serving it at a dinner tonight. Turned out PERFECT!!!! Can’t wait to ‘wow’ all of the party guests with it! Love the idea of this but despite your encouragement this seems totally out of my cooking league. springform? Would never have known if you didn’t insert photo. I’m having people over for halloween but I really don’t know if I’m up for this challenge, how lame is that? I cook constantly I’m just baking shy. That looks so delish and what a CUTE idea with the ritz crust! Can you really taste the pumpkin?? I bet sage would taste good mixed in there too…it goes so well with pumpkin! YUM, this looks amazing, thank you for the recipe! So, even though I’m not lucky enough to live near you, you can totally send that on dry ice and I’ll gobble it right up. Yum! I’m so making this for my next get together!! Oh my… YUM!! You have the most amazing recipes! Aah!! Oh man this looks good…I was questioning the whole savory cheesecake till I saw the ingredient list. Loving the Ritz cracker crust. I cannot wait to try this one out…I am thinking figs would be great too! I am totally marking this little beauty for Thanksgiving! You always make such pretty food. Mine usually looks like cat vomit. Really, I should learn from you. Ha! yummy!! this looks to die for. Savory cheesecake are one of my absolute favorite things, in the world!!!!! This looks killer, and I love that I can use my little springform pan for it! This looks SUPER delicious – and I love “easy-to-make” things, because if they aren’t easy right now, I simply don’t make them! YUM! HOLY MOLY this looks DELICIOUS. So yummy! I made a white chocolate cheesecake that was pretty AMAZING. You’re a genius! This is amazing…I’m def making it for a party this weekend! I’ve always loved standard plain old cheesecake…mmmm! Looks SO yummy! Okay, sorry if you’ve already addressed this, but how did you get that cutie “Pin” button? Is there some easy code I can pop in? I love that! What an interesting dish!! Perfect for the upcoming holiday season! Well this is gorgeous and just sounds fantastic! Wow this looks extremely impressive. I can’t imagine what it must taste like. Thanks for sharing! I am not a huge cheesecake fan but this sounds good. I made an incredibly good choc cheesecake once. Too rich to eat an entire piece though. Interesting! I think this would be a fantastic alternative to the classic cheeseball youn often see at parties. This is great! I love taking dishes like this to parties – they look (and taste) impressive but only take 10 mins to create. Bookmarking fo’ shizzle! Oh this sounds wonderful!!! Love pumpkin recipes! Ah and Shannon’s comment just made me notice the sweater! You are awesome. Holy crap this looks awesome! Love how it looks like a cheese wheel when it’s all done. Super cute! That looks GOOD! 🙂 yum! That is a masterpiece if I ever saw one!